The Dallas Cowboys turned over a new leaf on November 8th when Jerry Jones decided to finally pull the plug on Wade Phillips following an obscene 45-7 loss to the Green Bay Packers. Once Jason Garrett stepped in the Cowboys started to look and play like a different team. In Jason Garrett’s first game as head coach, the Cowboys went into The New Meadowlands Stadium to face their divisional rivals and came out with a big 33-20 win against the New York Giants. In Garrett’s second game as head coach, the Cowboys beat up on the struggling Detroit Lions and brought their fans the first home win of the season. Drew Brees and the defending champion New Orleans Saints handed Jason Garrett his first loss as head coach of the Cowboys on Thanksgiving Day. The Cowboys were poised to take down their third straight win under Garrett but Brees orchestrated a late fourth quarter drive to reclaim the lead 30-27. Prior to the start of the season, several NFL analysts predicted that the Cowboys would be one of the top teams in the NFC and will have a chance to win a Super Bowl in their home stadium. The Cowboys have been a disappointment from game one when they lost to the Redskins. Even though Jason Garrett is 2-1 as a the Dallas Cowboys head coach, the Cowboys are only 3-8 on the season and will likely miss the playoffs this year even if they win out. While the playoff hopes for the Cowboys are slim to none, the change at the helm has played a major role in restoring fan sentiment. Leading up to Wade Phillips’ final game as the Cowboys head coach, ticket prices on the secondary market were steadily plummeting as fans were calling for Jerry Jones to fire Phillips. The Dallas Cowboys average ticket price was $222.81 at the start of the season and gradually fell 37.7% to $138.75 the day Wade Phillips was fired. Ever since Phillips was fired and Garrett took over as interim head coach, ticket prices have been sharply climbing at a steady pace. 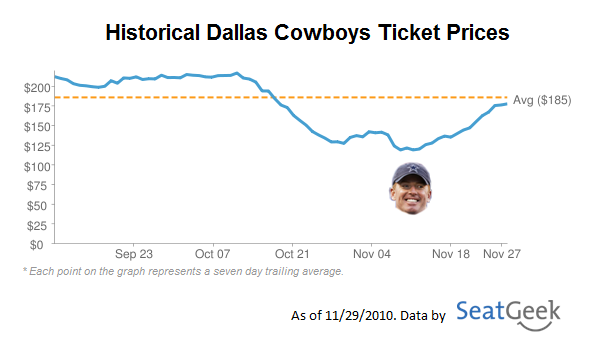 As of today, the average ticket price rose 27.9% since November 8th when Jason Garrett stepped in as interim head coach. Let us know how you feel about Jason Garrett as the Cowboys head coach in the comments or on Twitter @SeatGeek.